Chances are you've seen some of Nintendo's newest foray into the world of NFC figures floating around your favourite electronics section. Despite their somewhat lacking practical use in actual games they've become quite the collector's item overnight. What Does an amiibo Do? As stated above, amiibo are figures that use near field communication (NFC) in their base to store player data or unlock content in games. This kind of "toys come to life" content has been widely successful with both the Skylanders and Disney Infinity series over the past years. Though Nintendo first tried NFC figures with Pokemon Rumble Arena for Wii U, this is their first time producing multiple waves and more detailed characters. Games that currently support amiibo are Super Smash Bros. for Wii U, Mario Kart 8, and Hyrule Warriors. Nintendo has also announced amiibo support for already released and upcoming titles such as Captain Toad, Kirby and the Rainbow Curse, Mario Party 10 and Yoshi's Woolly World. It should be noted that not all amiibo work in all games. For reference use this handy chart that Nintendo has created. Currently two waves of amiibo have been released to the public. Wave One: Mario, Peach, Donkey Kong, Link, Kirby, Yoshi, Star Fox, Samus, Pikachu, Wii Fit Trainer, Marth and Villager. Released November 21st, 2014. Wave Two: Little Mac, Captain Falcon, Zelda, Diddy Kong, Luigi, and Pit. Released Dec. 14, 2014. Wave Three will be released in early February and will include Mega Man, Sonic, Toon Link, Bowser, Ike, Lucario, Sheik, Roselina, Metaknight, King Dedede and Shulk. 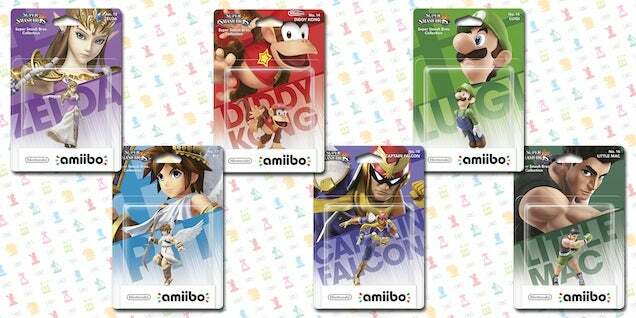 Wave Four will be released in April and will include Wario, Lucina, PAC-MAN, Ness, Robin and Charizard. A new series of Super Mario Bros. amiibo will also be released on March 20, along with Mario Party 10. They include five already released characters (Mario, Luigi, Yoshi, Peach and Bowser) in new poses and introduce a brand new Toad amiibo to the mix. It should be noted that amiibo are not region locked. Meaning that no matter what country you purchase them in/from they will work with your games. Nintendo hasn't done the best job of getting certain amiibo on shelves, especially in regards to the second wave and Christmas just past. No one officially knows what kind of run each character will have aside from the fact that well-known characters will have more figures produced and less popular ones will have fewer. This has led to a scramble for lesser known characters and resulted in some outrageous scalping on eBay and Craigslist. Hard to find characters include Wii Fit Trainer, Villager, Marth, Captain Falcon, Pit and (occasionally) Little Mac. Marth, Wii Fit and Villager have been highly sought after since their release in late November and have garnered the nicknames "MTV" and "The Holy Trinity" online. Due to a bizarre lack of information on Nintendo's part it seems Wave Two was split in half, pushing the release of Captain Falcon, Pit and Luigi back. As a well-known character Luigi is usually easy to find and purchase, but Cap and Pit are considered rare finds at the moment. Many sites and stores will allow you to preorder amiibo that have not yet hit store shelves. Sometimes preorders for store exclusives, like Rosalina and Shulk, sell out in minutes. This means you must be ever vigilant! If you're not sure if you even want a figure it's best to preorder anyway, as you can always cancel if you are sure you don't want it. NowInStock.net (mentioned below) can also be used to alert you when preorders become available. Just like most gaming-related merchandise, amiibo are sold all over the web and from most big name electronics stores. What they have in stock is the real issue here, assuming you're not just looking for Mario. Aside from simply checking each store everyday multiple times (which I did for about a month), there are a few ways to keep tabs on almost every store at once. Enter NowInStock.net, the best thing since sliced bread (for amiibo hunters at least). After creating an account you can have alerts sent to you via email or text that let you know when a figure has come back in stock online. This can be exceptionally helpful for characters such as Pit, who sell out in mere minutes. You won't have to worry about checking sites like a maniac and it gives you the advantage of knowing immediately. This also works for pre-orders and store exclusives. Unfortunately, some figures will not be back in stock online any time soon. That's when buying from other countries' sites is exceedingly helpful. Many folks who don't really care what version of amiibo they have or are going to unbox them anyway, have been heading over to Amazon.de (Germany) and Amazon.fr (France) to pick up hard-to-find figures such as Marth and Villager. Figures will cost a bit more than from home and shipping can be more, but you can finally hold that beloved Nintendo hero in your sweaty mitts. And since amiibo from all over the globe work with any game or Wii U you'll be good to load that German Marth on to your Smash Bros. game. Of course you can always try online sites such as eBay and Craigslist, but you're probably not going to find the best deals. Always be weary of fakes, and make sure you meet up in a public place if you are exchanging money for goods in person. All the stores mentioned above are worthing checking if you're out and about. My main advice when it comes to physical shopping is "Call ahead!" If you do so you may be able to get a kind employee to hold the figure you want behind the counter for you or you may find the shop is sold out and not worth the trip. That being said, always be nice to those employees helping you in store or on the phone. They may not even know what an amiibo is or where to find them. Help them help you. If you're not sure if they're actually in the know or have a sneaking suspicion they're just trying to get rid of you with easy answers, find/contact a manager or the service desk and have them look up the item as well. One way to really help speed things along is to give the employee the amiibo DPCI or SKU number. Come in to the store with that number and someone may be able to find you some in the back that have yet to be put out. Another fantastic way to spread your net over various stores and regions is to enlist the help of your friends and family. Does your mum go shopping every Sunday? Have her swing into the electronics department and do a quick sweep. Have a friend who lives a few counties/cities over? Ask them to check their shops when they get a chance. Just don't be all weird and pressuring. Help them by sending pictures of who you need. Make it easy for them to help you. Not sure if you should open your amiibo or leave them in box? Hopefully it's not too difficult of a decision. If you're planning on using the amiibo to unlock the (somewhat minimal) features in current and upcoming games then open them! Sadly Nintendo put in a special sticker under each amiibo to prevent them from working through their packaging. Though as you can see in the video below it can be surgically removed if need be. Does My amiibo Have a Rare Defect? Is it sideways, broken or have some slight paint imperfections? If so then it's sadly nothing special. I can't tell you how many people are posting amiibo (like the one below) to eBay that they claim are rare defects, but in reality are quite common. Most gaming folks have heard of dual-wielding Samus or legless Peach, but these are few and far between. If your figure has an extra feature, is missing something completely (meaning it hasn't just fallen off in the box) or has been coloured wrong in big way then you may have an actual rare defect on your hands. Some of these go for thousands of pounds on eBay (though most don't), so it's up to you on what you do with it. I'd love to have some in my collection, but I'm not you. If you find a rare or highly sought after amiibo character you may think to yourself, "I should buy them all and turn a profit on eBay!" You could. You certainly could. You could jack up the price and make some extra cash. But keep in mind that you're basically screwing over Johnny Everyman, who is on the lookout for these same figures, just like you. Let's say you heard that a shop just got in five Villager amiibo and you really want one to finish out your Wave One collection. You get to the store to find some scumbag loading all five into his trolley. Damn. I bet he's gonna make a bundle! But you don't wanna be that guy, do you? Maybe you do. Maybe you don't care. People do this kind of thing all the time after all. Just keep in mind that others are out there hunting and you're making things more difficult for them in the long run. Feeling a little alone in your amiibo struggles and victories? Head over to /r/amiibo and look around. Whether you are hunting down a specific figure, showing off your newest finds or wondering how to make a custom display there are dozens of fine folks who can help. It's a great place to stay in the loop when it comes to stock and pre-orders as well. Not to mention/r/amiiboswap, where you can trade for figures you need. I highly recommend you give it a look if you're even mildly interested.